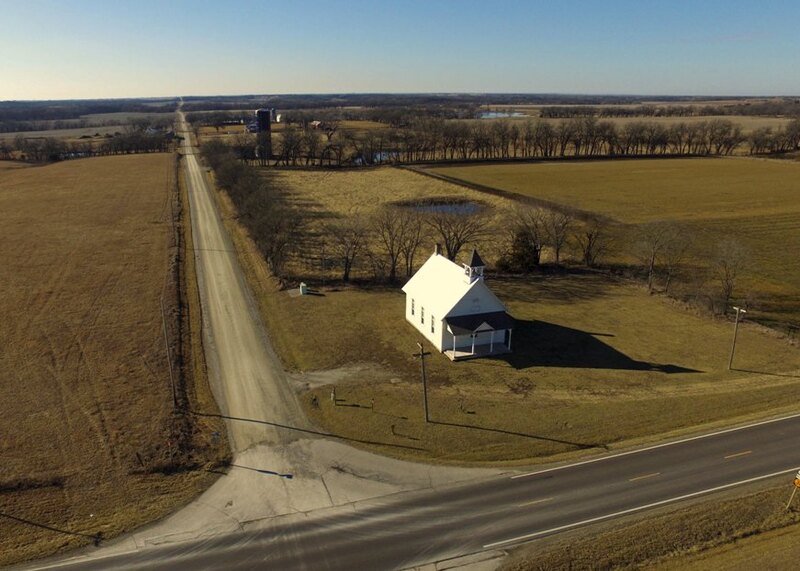 Superior School – Burlingame Historical Preservation Society, Inc.
Two miles south of Burlingame on US Highway 56, at the northwest corner of the intersection with 189th Street, resides the Superior school house. While this was not the first or only school to serve the community of Superior, it was the last. It was in Spring of 1950 when students left the building for the last time. The school site was deeded to School District No. 2 on August 1, 1868 from D. B. Burdick, first sheriff of Osage County. By August of 1894 the school at that location needed many repairs and some thought was in an unsafe condition. A bond election was held and it was decided to build a new school. Work commenced and the second week of December that year the new building greeted it first students. If walls could talk, what stories would they tell? Superior’s stage curtain was purchased by local patrons and hung until the school closed. Much of the community’s livelihood was displayed on the curtain, as the names of contributors were written on the curtain, as advertising. The curtain is on display in the Schuyler Museum. After Superior School closed, it served various purposes which included a meeting place for youth groups and church services. For many years it was also used as a polling place for the residents of Dragoon Township, but was eventually deemed inadequate as a polling location due to the lack of restroom facilities and accessibility for the handicapped. The Dragoon Township board continued to meet at the school for a period of time. It is now in the care of the Burlingame Historical Preservation Society, Inc.
Superior was the first town and the county seat in what was then Weller County. J. M. Winchell, for one, helped establish Superior, which included 640 acres for its plat. Before Osage County was organized Winchell succeeded in introducing it as a strong candidate for capital of Kansas, only being two votes behind Topeka. Weller County was renamed Osage County March 11, 1859. It was also 1859 when a tornado left but little more than a name to Superior, which was virtually the end of its existence. Postal records indicate a post office was established March 4, 1859 and was discontinued Sept. 9, 1862. Superior was significant in our history, though it was short-lived. Today Superior School is all that remains as evidence of the location of the town of Superior. In keeping with Burlingame Historical Preservation Society’s mission statement of preserving area history, work is underway to SAVE THE SCHOOL! In 2014 work began and has been on going since.